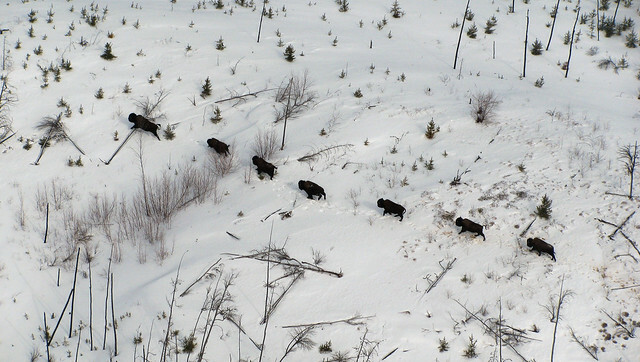 The Ronald Lake Bison Herd in the newly established Kitaskino Nuwenëné Wildland. The wildland will preserve more than 160,000 hectares of land just south of Wood Buffalo National Park, protecting the Peace-Athabasca watershed and increasing ecological integrity and habitat for species at risk such as woodland caribou and the Ronald Lake Bison herd. Kitaskino Nuwenëné means "our land" in both Cree and Dene. Initially proposed by Mikisew Cree First Nation, the wildland will safeguard their way of life while addressing concerns raised in a 2016 UNESCO report on Wood Buffalo National Park. It adds to the largest contiguous area of boreal protected land in the world. By voluntarily relinquishing oilsands and mining leases in response to Indigenous Peoples’ concerns, industry champions Teck, Cenovus Energy and Imperial played a vital role in securing the land base for the new wildland. Kieron McFadyen, senior vice-president, Energy, Teck Resources Ltd. Previously proposed as the Biodiversity Stewardship Area, the new wildland is the result of months of collaborative discussion between Indigenous groups, industry and other stakeholders, and federal and provincial governments, as well as public consultation.